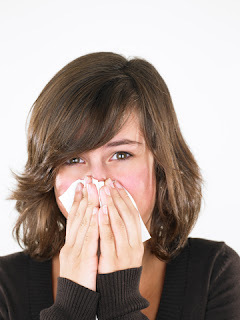 Non-allergic rhinitis (NAR) is a condition where a person exhibits many allergy like nasal symptoms, but has normal allergy test results, normal CT Sinus scan, and/or normal structural nasal endoscopic exam. It is a condition loosely termed the "hypersensitive" nose. It is also known as vasomotor rhinitis. NAR can be divided between non-inflammatory and inflammatory NAR. Inflammatory NAR can also be further broken down into different subtypes based on nasal smear cytology. 1) NARES - Non Allergic Rhinitis with Eosinophils: This sub-type is characterized by >20% of cells being eosinophils on nasal cytology. 2) NARMA - Non Allergic Rhinitis with Mast Cells: This sub-type is characterized by >10% of cells being mast cells on nasal cytology. 3) NARNE - Non Allergic Rhinitis with Neutrophils: This sub-type is characterized by >50% of cells being neutrophils on nasal cytology. 4) NARESMA - Non Allergic Rhinitis with Eosinophils and Mast Cells: This sub-type is characterized by >20% of cells being eosinophils with concurrent >10% of cells being mast cells on nasal cytology. With respect to NARNE, avoiding the offending chemical trigger often resolves this condition without the need for medications (for example, chlorine in swimming pools may trigger this response and by avoiding chlorinated swimming pools, NARNE may resolve spontaneously). However, distinguishing the sub-type may provide further prognostic information in that NARESMA has the poorest response to medications. Also NARESMA has the highest chance for nasal polyps developing at some point in the future and for polyp recurrence after removal. NARESMA also has the highest risk for the development of asthma. Nasal cytology in children: recent advances. Ital J Pediatr. 2012 Sep 25;38:51. doi: 10.1186/1824-7288-38-51. Non-allergic rhinitis with eosinophils and mast cells constitutes a new severe nasal disorder. Int J Immunopathol Pharmacol. 2008 Apr-Jun;21(2):325-31.